Spent my Sunday working and styling the whole day. Had a prenup shoot from 8am til 7pm plus ASAP which my assistant Carvey handled for me. So happy to have worked with Sir Aaron Ebio again plus the couple-- Estela & Lester-- were both nice and easy to work with. Hopped from one location to another just to achieve the pegs and photos they want. I want to give a shout out to my friend Patrick who gave us permission to shoot in his resto (Borough) for free. No questions asked. Thanks Pat owe you one! :) Will post photos soon but for now here's me and my outfit that day! Photos were taken at Gercon (Makati) tower's rooftop which the groom's family owns. Ang bongga lang! Obviously someone had too much fun posing and snapping (Mich). Lols. Wanted to wear something comfy and easy to move in, so I wore my new Sabrina shorts and trusty Wrangler denim shirt! Didn't want to wear flats coz heels make me feel more confident when working (a trade secret! ), so I wore my orange wedges from So Fab. Gave me a little height plus it's extremely comfy. Also loving my new arm candies! Lakas makayaman. Heee. Took us 30 minutes to finish shooting, because I got carried away doing weird poses. Mich almost peed in her pants from laughing too much! Okay I peed a little from laughing and moving too much. Wahehe! nyahaha! andami ko pang kakatawanan shots pero d ko na ipopost ayoko majudge! haha! at Fully Booked, BGC. Love this location! 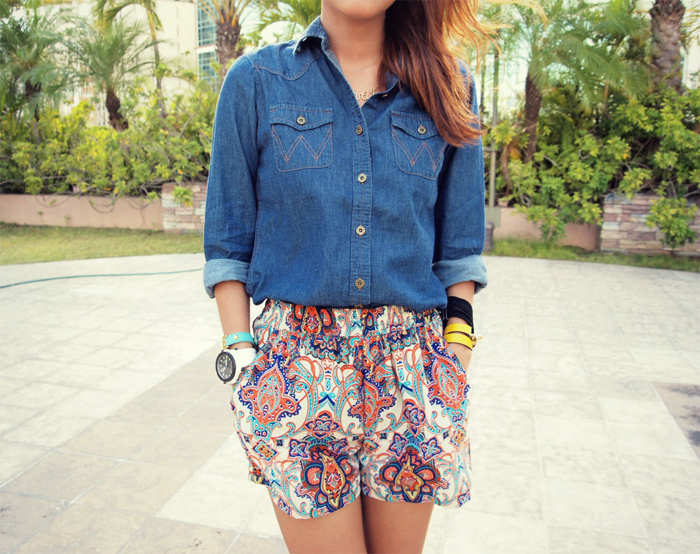 Never thought denim shirt would be perfect with those kind of shorts!!! LOVE it!! i like how you finished the whole outfit with those cute wedges!!! Adore!! I love your denim top! goes well with your orange pumps. I agree with Czarina! Ma-try nga :) Hehe! give you currently the meat products and also properly trend the side to your brisket handling it a distinct style. Their list relating to instruments with your aging parents is actually really unrestricted.